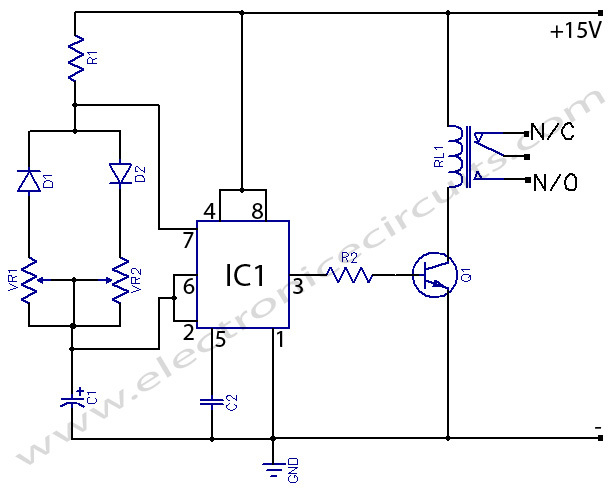 Here is a timer circuit using common IC 555. The circuit is designed to facilitate time adjustment of both charged and discharged states of the relay. The circuit uses IC 555 in astable operation. Separate delays for charged and discharged states of the relay are achieved by using two diodes (D1 and D2) and two potentiometers VR1 and VR2 provide control over the ‘on’ and ‘off’ stages of the relay, respectively. The circuit with given values of VR1, VR2 and C1 provides time periods that are adjustable between a fraction of a second to about one-and-a-half minute approximately. IC 555 used should be in good condition (preferably a new piece); old ICs can sometimes give wrong results. 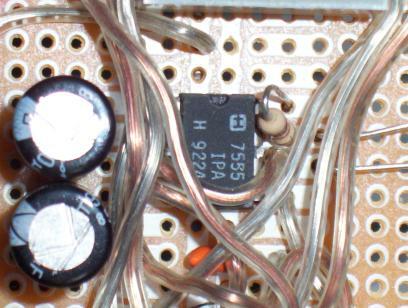 And capacitor C1 should be of a good make, such as ‘Keltron’ ,’Uptron’ , ‘philips’. Can we use 12v instead of 15? this circuit i will operate 24 volt relay,what can i do? I made the timer circuit but the relay is not operating as the coil voltage is low it’s 2.8 volts. Please suggest what can I do to rectify it. I need the delay off timer after the power on. It means that whenever the power source connected, the relay is automatic energize within certain period and then back to dis energize. So delay off timer is just work one time only when after the power source is connected to the circuit. please your advise me the circuit diagram. I stumbled on this while looking for a timer that does exactly what this one does. Is there somewhere I could get a PCB to populate for this project, or the completed timer itself… or do I just have to “breadboard” it and put it all into some kind of case? Relays are not charged or discharged, they are simply on or off with the normal position defined. And why on earth have you chosen to use a 15 VDC supply, they are not exactly commonly available. Surely 9 or 12 VDC would suffice? Finally it’s not clear to me whether the on & off times are linked, in other words does adjusting one alter the other? I have to change it about 2minits- 5minits. can you please tell me how it wants to change. I need an On delay of about 3 seconds, and an instant off. Will switching the supply power ON give the delay required, and then switching power OFF, should give an instant off? I NEEDED A TIMER 8 SEC ON 4 MIN OFF AND NOW EVRYTHING IS OK.